One of the many things I have learned is when it comes to technology all of the functionality in the world that can be incorporated will not make you use a device if there is not at least some sense of style behind it. There is no technology that this is truer than with wearables. There are currently a lot of wearable devices and clothing designed with fitness in mind. These items can monitor, alert and signal all sorts of things that will help you with your workout routines and help to keep you on track to being fit. What you do not see is these items being part of the old sweat and track suits that everyone used to wear. People who are running seem to want to be noticed and companies such as Adidas and Nike make outfits and wristbands that are meant to be seen in. One market that has not shown too much style so far is smartwatches. Those manufacturing smartwatches are trying to put so much functionality into each model that you might as well wear a smartphone on your wrist. Since no one wants to do that, what are the options? At this year’s Mobile World Congress in Barcelona, two companies have taken up the challenge. LG and Huawei were both present to show that form could be added with functionality to deliver what looks like a luxury watch. 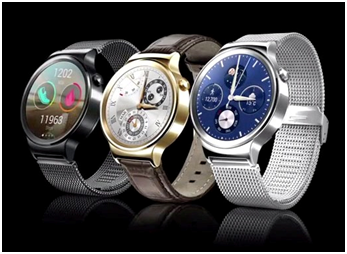 LG presented the LG Urbane, while Huawei unveiled the Huawei Watch. 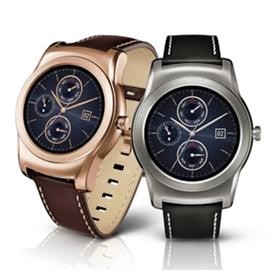 As you can see from the images below, with the LG Urbane on the left both designs can easily pass for what is considered the conventional luxury timepiece, when their round screens are in watch mode. Both are handsomely designed and come in multiple colors with metal and leather straps. With the exception of Apple’s Watch, most of the other smartwatches on the market run on the Android platform. LG takes a slight departure at this point, while it does have an Android version it also designed the LG Urbane to run WebOS. This is an operating system originally developed by HP for smartphones and tablets but now an open source project, although it should be noted that this is really an experiment. One departure that we see from Huawei is that unlike other smartwatches, which have toughened glass, the Huawei model, features a sapphire crystal face. While it is true that the smartwatches were on display this week, what is unclear is the actual functionality they will provide. It sounds like the LG Urbane contains a near-field communications antenna, which means that it can most likely be used to process mobile payments. Will this be the future of smartphones? It is hard to say what else can be packed into the small wrist worn devices. This is not a new market, in fact, back in 2013 40 companies launched smartwatches, most of which were small startup companies. What is changing is the entrance of big vendors in the market. The wearable computing device has not been as successful as it could be due to the bulkiness, ugly look, battery issues and weak functionality. However, after the launch of number of new smartwatches, especially devices such as what LG and Huawei displayed this week, consumer perceptions are changing. Smartwatches are becoming an important accessory to smartphones.